Such gatherings first became popular in the mid-1800s, when indoor ovens became increasingly commonplace (communal ovens were the norm in villages and on farms). As home baking became easier, the availability of recipe books led to people experimenting more, and the variety of coffee-time goodies increased accordingly. While extreme rationing during the First World War meant that southern Jutland’s coffee times were a more austere affair, they took on a new significance during the Nazi occupation of Denmark in the Second World War. The occupiers outlawed public meetings, but welcoming guests for (ersatz) coffee in the home was permitted. So what better way to discuss resistance than doing it while stuffing your face full of delicious baking at the same time? Of course, there was also an element of out-doing the neighbours. At communal coffee times at a village hall, each wife would bring her cake. 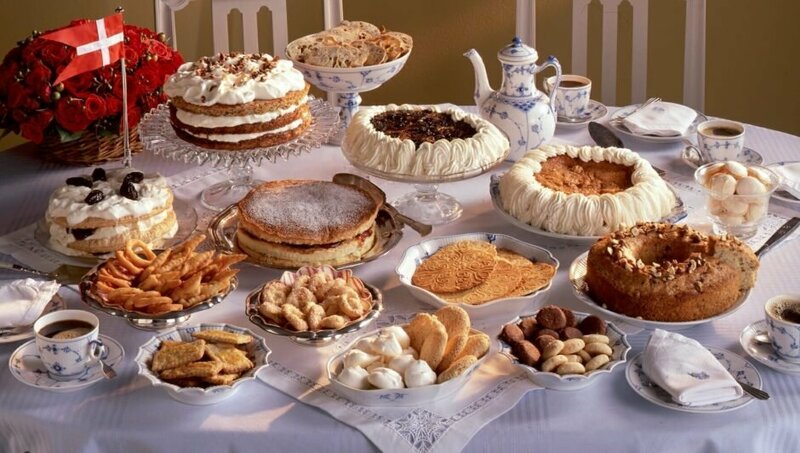 But maybe Gerda would bring two different cakes, while Katrine down the road might attempt to outdo her with four types of biscuits. A bake-off gone nuts. These days, a typical Southern Jutland coffee table is served in hotels and restaurants, and also sometimes at weddings, christenings and funerals. In fact, the other day I called my dad, who was on his way to Sønderborg with my uncle. He told me that a distant relative had sadly passed away, and they were attending the funeral. I offered my condolences – to which I heard my uncle chirpily reply in the background : “Ah, but there’s a full coffee table afterwards!”. Present seven types of soft cakes and seven types of biscuits or hard cakes. People gathered around the table to take one portion or slice of EACH soft cake on your plate AT THE SAME TIME. Yes, really. You don’t have to do that any more, but that is the tradition. The reasoning was that if you got full up and hadn’t yet tasted Helle’s delicious strieftorte, it just would not do. Start with the soft cakes, followed by the hard cakes. Always. Never the other way round. There is a huge list to choose from – some that probably wouldn’t appeal to our pallets these days. The popular ones will always be layer cakes of all shapes and sizes, from strawberry with crème pâtisserie, to ones made with berries from the garden. You will probably always have someone attempting a rye bread layer cake (it’s an interesting thing). Kartoffelkage is another good one – literally ‘potato cake’, but it has nothing to do with potatoes. And then there are tarts, kringles – and so it goes on…. The hard items include fried wheat biscuits known as ‘klejner’, as well as the more familiar butter cookies. My very favourite kaffebord item is a biscuit called ‘Ingenting’ which literally means ‘nothing’. Ingentings are the last biscuit served. A host would ask a guest what more they could eat, to which they would answer ‘ingenting’. 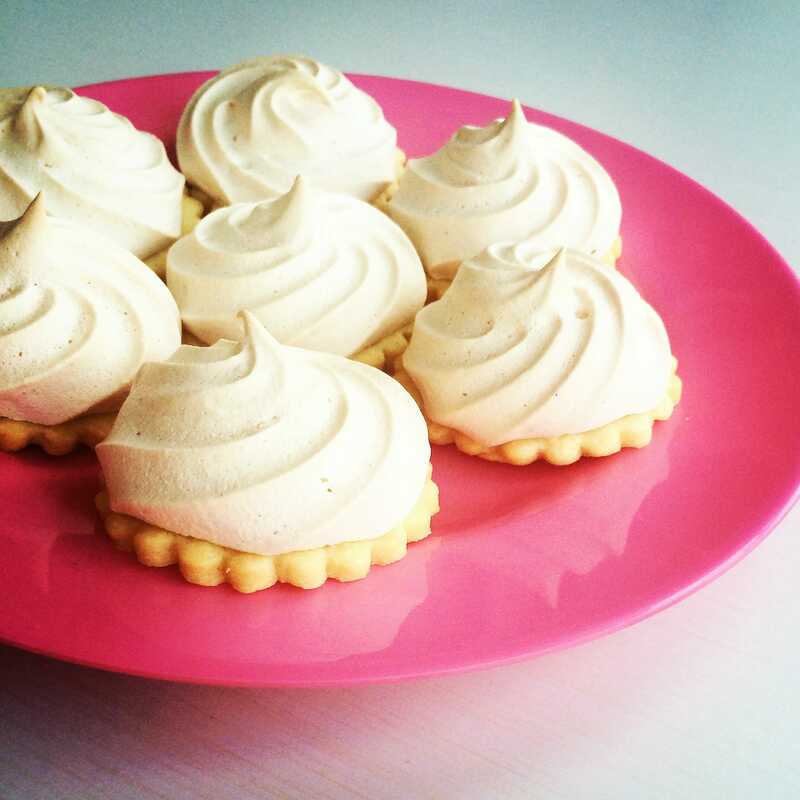 And so the guest be offered precisely that – one of these deliciously light, soft meringue biscuits. Because there is always room for nothing. In a food processor blitz the ingredients for the biscuits (if you don’t have a processor, crumble the cold butter into the flour, then incorporate the rest of the ingredients). Do not work the dough too much. When it is smooth, pop it in a plastic wrap and leave in the fridge for at least 30 minutes to set. Meanwhile, make the meringue topping. Whisk the egg whites with a teeny pinch of salt. Slowly add the sugar and vanilla sugar, bit by bit, and whisk on high speed until you have a shiny, glossy, firm mixture that forms sharp peaks. This will take quite a while. At the end, add the vinegar and – if using – the chopped almonds. Roll the dough out on a floured surface to the same height as a digestive biscuit. Use a round cookie cutter to cut out the biscuits and place on a baking tray. Repeat until all dough has been used. Either spoon out or use a piping bag to get the meringue mixture on to each biscuit. I like quite a thick layer (so the meringue stays gooey in the middle), but if you prefer less, this also works. Bake in the middle of the oven at 150 degrees for around 15 minutes until the base is cooked. I usually leave mine in the over with the door open for a further fifteen minutes,but this is optional. Variations: add colouring, different flavours and experiment. This really is a lovely light treat and worth the effort.